I’m a planner. I always have been. And, as my kids know, I like to have a Plan B. Possibly a Plan C, etc. depending on the particular circumstances. I approach the High Holy Days with a plan as well. Or, should I say, several plans. I have a plan as a rabbi. Another plan as a pray-er. And still another one as the resident balebuste. 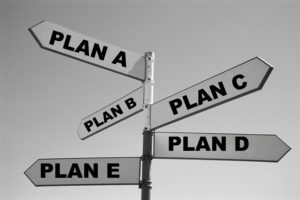 The rabbi plan actually starts months and months before Elul. I think about the sermon topics I might want to address. I start reviewing the liturgy and begin to craft the overall arc of the services. I search for additional readings that I’d like to introduce. 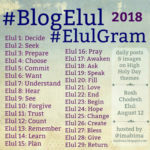 As a pray-er, I start doing my soulwork as the new moon of Elul appears. I listen to soul-stirring music. I study passages in the machzor that I find troubling. I check the Torah and Haftarah texts to see if there are commentaries that resonate with me. For each one of these plans, I have back-up plans. Excessive? Maybe. But it eases up some of the anxiety I feel this time of year. How do you plan for these holy days?